The composition of this engine is focused on the ease of use. We had seen others 2D engines and we decided to design MindShake with all the features we think are essential. 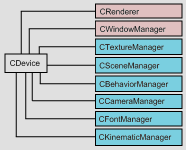 In this way we decided to have one main object called “Device”, this element can provide access to all managers of low level elements, so we have them organized and they can be quickly accessed. Some of these objects will never be used by the user, like the renderer, the window manager or the texture manager that are only necessary for set some options or get information from the system. But others will be intensely used, like the Scene Manager that defines all the elements present in the world, or the Behavior Manager that handles the behaviors of the diferent details of our world. Today we embedded a reduced subset of Tremor library, an optimized integer-only implementation of the OGG Vorbis decoder, thought for embedded devices. Without OGG Vorbis nor Tremor embedded, that permits you to link with the original libraries or your own implementation. Other one without any OGG Vorbis support (small size). This version takes only 97 KB in size. We are noticed that there are some people who are bothered with the fact of have to link with multiple libraries (libogg, libvorbis and libvorbisfile) only for have support for another audio format. For this reason we made a reduced ogg vorbis library subset only for decode it. And then we included this code inside BrainWave. We said reduced because it is only 135 kb in size. Other one without OGG Vorbis embedded that permits you to link with the original libraries. Other one without any OGG Vorbis support. In this way, the BrainWave users can select the best choice for his app. Today we added support for a new file container (OGG) and for a new codec (Vorbis). With this codec you can add great quality sounds with small size to your games or applications. As promised we have improved our codec system. Now all parsers & codecs have less lines and more clearer source code and they are simplest to understand. Furthermore, we can easily add more file formats to parse or add more audio formats to decode. MindShake includes support to add layers and cameras, with no limits, you can create as many layers and objects inside layers as you want. MindShake includes managers for layers and cameras which act as factories, so you can easily create new objects. Later, to easy access to these objects, you can store the reference or give them a name, so you can ask the managers to recover one object with its name. By default all layers created are configured to adjust to camera renders. If the user want to have a serie of static sprites on the screen, the common way is to put them on a layer that is ignored by camera transformations. To create a usable sprite layer you need one instance of the scene manager and then invoke the method CreateSpriteLayer. With this example you see how to create a new sprite layer and modify it to ignore the cameras, so any sprite created into this layer will be shown relative to the upper left corner of the screen. With the layer created you can now add one or more cameras to view diferent parts of our world. When we add a new camera it is important to tell it the size and position of the viewport (the region where the camera content will be seen) and the dimensions of the world (the region where this camera can move). Now you can see one example of scroll. If our window have a 320×240 size, with this example you will see a scroll effect when move the camera around the world, because it have double size than camera viewport. It is easy to create more cameras, you only meed to set the viewports in order to view them correctly, for example you can split the screen with three cameras, two of them at the top and one at the bottom. Now you can move the cameras with the SetPosition method and every viewport will automatically show the camera content. We are noticed about some people needs support for .AU files on MACOS (or .SND files on NeXT or some *NIX systems). For this reason we added support for this file format. Adding this format we have realized that the system of codecs could be improved, shortly we will update it. Congratulations! Now we have another common audio file format for BrainWave and we will have an easiest audio codec system. Lucera Project is a small videogame company that wants to realize some basic libraries to help other ‘indie’ programmers to make games easily. Performing all difficult and cumbersome stuff to allow developers to implement their games without worrying about details like load sounds and textures, render on screen, capture inputs, and so on. We hope to help many people to achieve their dreams of creating video games. MindShake includes a behavior engine that allows the users to easily create custom ‘event driven’ logic, per full game or per sprite, that can be reused in various games. In this way the user can split logic into several behaviors, defining initialization code (BeginSprite), defining simple actions for events like mouse clicks, per frame process ‘EnterFrame’ for single sprite or whole game, etc. Furthermore, the user can reuse the same behavior into multiple sprites. For example, in a platform game, the user can define a behavior to control where a sprite can walk, fall down in case of having no ground under their feet, rising stairs, etc. Then the user can attach this behavior to all the sprites that are able to walk on the platforms. First you must define the radius of the sphere, or spheroid, which wraps the listener. Out of the defined spheroid, the listener will not listen anything. Finally you can change the position of the listener (default 0, 0, 0) and the position of the sound objects that appear in the screen.